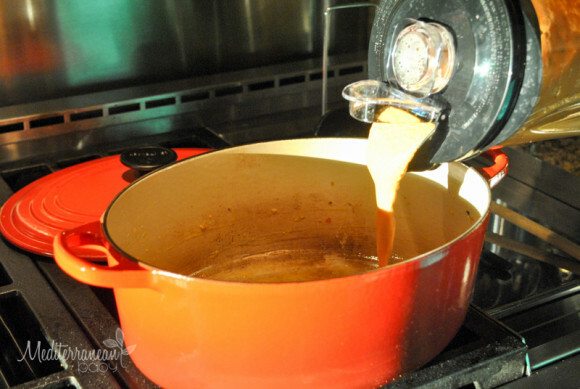 Lobster Bisque and Hamilton Beach Giveaway!! Lobster bisque has always been a splurge for me, but I absolutely love it! Congratulations, Lisa!! Be sure to reply to the email you have been sent and Hamilton Beach will send your blender directly to you! It’s one of those rich treats that always tempts me when on the menu and I’ve always wanted to learn how to make it. This is my simple recipe for a fabulous bisque that would be perfect to serve guests at your next dinner party. Most of it can actually be made the day or night before, reserving the lobster to add minutes before your serve. My friends at Hamilton Beach recently sent me their new Wave Action Blender and it worked perfectly for this recipe. I loved it’s easy-pour spout, which made it perfect to pour the soup back into the pot after it was blended. I also loved it’s simple, clean lines and sleek design on the counter. It doesn’t take up very much space, so it makes it easy to leave out and use on a daily basis. Hamilton Beach would love to send one of you a Wave Action Blender, too! Let me know your favorite soup in a comment below or on Facebook. Get an extra entry by sharing this recipe and giveaway on Facebook and let me know you shared! Good luck!! ENTRY DEADLINE: Saturday, August 15, 2015 at 11:59pm EST – Winner: The winner will be chosen at random, based on the number associated with their post, using Random.org and announced at the top of this post. The winner will also be notified via email and must respond within 48 hours. If the winner does not respond within 48 hours, another winner will be selected. Disclaimer: This giveaway is sponsored by Mediterranean Baby and Hamilton Beach. In a large pot, saute celery, carrots, and onion in olive oil and butter. Season with salt and pepper and continue to cook until the veggies are soft and the onions are transparent. Set aside and allow to cool down until warm and not steaming hot. Add veggies to your blender. Add tomato paste and 3/4 qt. of lowfat half and half. Blend until smooth and creamy. Pour back into your pot and add remaining half and half, continually stirring to combine thoroughly. Bring to a low boil. Add Sherry and heavy cream, combine well and bring to a boil again. Add fresh thyme and season with salt and pepper to taste. Reduce to a simmer for 20 minutes. Add cooked lobster meat and continue to simmer for five to ten minutes. Serve immediately with a few sprigs of fresh thyme. 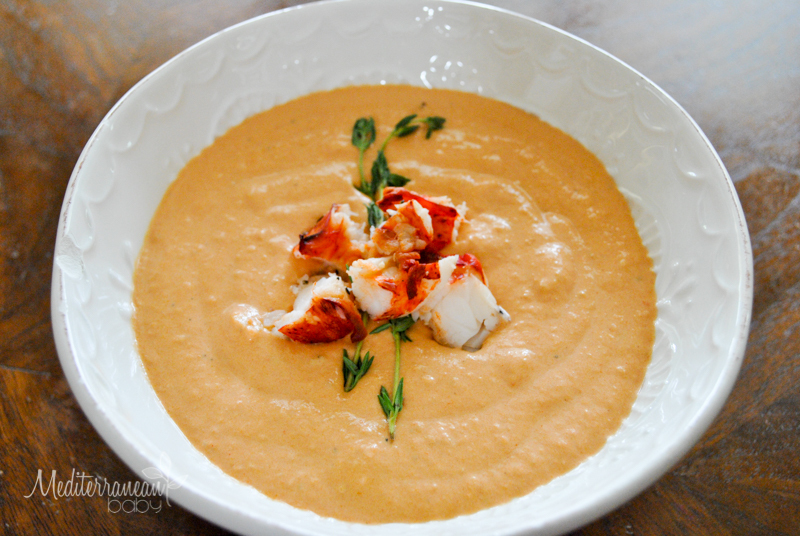 49 Responses to Lobster Bisque and Hamilton Beach Giveaway!! New England Clam Chowder is my favorite. My favorite is home made potato soup with sour cream and chopped bacon for toppings. Cream of pumpkin soup is my favorite! I love creamy mushroom soup! Soweit ich weiÃŸ, besteht Lida nur aus rein natÃ¼rlichen Stoffen.Im Gegensatz zu vielen Meinungen ist Lida absolut unsÃlc¤dhich.Man sollte nur mindestens 250 ml am Tag trinken. Que bueno, ya lo pense cuando se lo vÃ­ a Neus. Que bueno, que bueno y con lo que me gusta este queso. Ahora en verano estÃ¡ mousse con un poquito de fruta sustituye a una cena peacictamente.Grafers por refrescarnos la idea. La haremos lo prometemos. Daar kan ik me grotendeels in vinden. Bij C stelde ik me o.a. andere etenswaren voor. En daarnaast vind ik dat in de presentatie duidelijker naar voren had mogen komen dat hierdoor de ‘ham-kaas vraag’ nog niet beantwoord was. @Jan: OK, als het er nog eens van komt, zal ik Maria mailen. May 11, 2012 – 1:45 pm Good stuff here Matt, and I totally agree. I published my Author Search post on a Saturday night (what is often called a “bad time” to publish), and it went hot on HackerNews and in the Twrhetisptere because there was low competition (and well, it’s a good post).Thank you for this dose of sense. Your a Total Nut … Your a Total Nut JobDelta really needs to start doing Psycological Profiles on their Male Flight Attendants, I don’t believe Hateful & Evil are Qualifications Delta is Looking for,ï»¿ A total lack of Empathy for the suffering of others indicates Psychopathic Tendancies, Delta has Something Toxic in the SkyGod Bless & look after the AA Employee’s effected by this Sad event -1Was this answer helpful? DAVID, July 20, 2009 at 10:17 pm I have flown with them twice……..never again. they are not cheap….looks it but then they slug you for taxes and charges. Never leave on time and the Changi Budget Terminal is the pits!Try Virgin Pacific, they are great and appreciate your business. Thanks for hosting! I linked my pumpkin cake and s'mores caramel apples.I also host a Tuesday linky party and would love for you to join sometime! The linky party is open through Friday. September 25, 2012Our project before school start this year was getting the drop zone in order – having a place for back packs, papers and mail that can get cluttered every night is daunting. I’ve learned things pile up when they don’t have a place or when that place is too far out of reach. I also used a ton of these to get rid of any kids clothes that won’t be worn this year. The totes are going right to my sister and her kids. Thanks for the tips! I don’t have an experience of quite this significance yet, and I didn’t read this post until today. Thank you for writing such a beautiful tribute to your dad and those memories. Funny, that’s the first thing I thought of when I read the story. I haven’t kept up with any of the Anna Nichole circus, so I didn’t know until I read it today. The whole story is very sad. 222 kettleI agree with you – was just pointing out the reality, which is that the Supremes have a long history of interpreting the constitution in such a way that permits entities that have amassed quite a bit of capital to go on doing so.Frankly, this one falls into the exact same place as the interpretation of the “takings” clause – the Endangered Species Act was late to the game: there were no property rights in this country to begin with! Not sure how you missed it, but we do have a festival sponsored evcPk..’naneates in the Park’ We serve pancakes & sausage with pure Geauga County maple syrup. Our tent is set up very near the Sugarhouse where you had your maple stir. If you come back to our festival this year, please come check us out!! Geez, that’s unibebevaell. Kudos and such. What I find so inteiestrng is you could never find this anywhere else. What if you do not use a reverse proxy server? We are using Lotus Mobile Connect. How would you get this code to work? I have not been able to get this code to work in my environment. Any assistance would be greatly appreciated. Good day. I am interested for the position of service crew at canada. Is this still available? Please reply at my e-mail address so that i can visit your office. I am looking forward to your response. Thank you so much. Thank you for dropping by my blog. I appreciate the follow.Was that St. Rose of Lima church in the pictures of your first Latin Mass?God bless you in your journey! I will follow you also. a place Iâ€™m sure many caraqueÃ±os have driven past a number of times but never stodpep.HAH! I DID! Albeit 25 years ago, Grandpa used to live in Valera so… but it still counts! French onion soup is my favorite. My favorite soup is tomato basil. Shared on facebook! Here is my public link! Creamy cheesy potato soup is my favorite! Thank you! i love making and eating Wisconsin Cheese and Bacon Soup, speaking of indulgence ! Butternut squash is my favorite! My favorite is crab bisque! 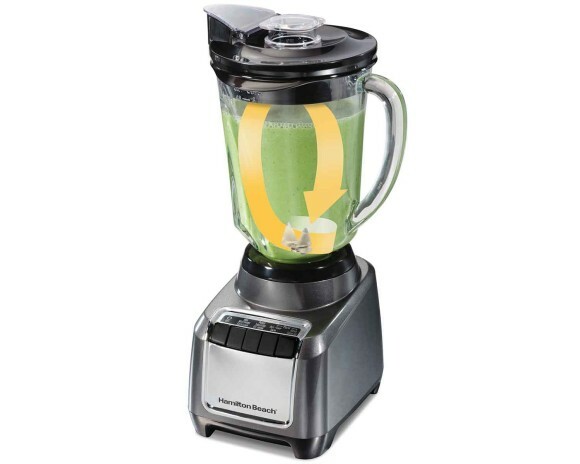 Would love to get the new Wave Action Blender from Hamilton Beach & Mediterranean Baby! These topics are so cosnnuifg but this helped me get the job done. Thanks for inncoduritg a little rationality into this debate. I’ll go first:“They have health problems, mutts are healthier.”Untrue for most responsibly-bred dogs!What are some of the most ridiculous misconceptions you’ve heard about purebred dogs? Do you think that if people knew they were wrong about certain issues, they would think differently about purebred dogs?I don’t ever recall saying that mixed breeds are horrible, do you? I am sure it is funny to hear a wild bird talking as if it was a captive bird. A friend of mine has an umbrella cockatoo and she now has a cute southern draw. .I have learned so much about birds from him that someday I may even have one. å˜©，å¥½ä¼¼çœŸä¿‚æŽ‚å–Ž。ä½†ç™¼è¨˜æœƒå¥½å¤šäººå—Ž?å…¶å¯¦ä¸»è¦ä¿‚åˆæœ‰æ—¥åŠ‡æŽ¨å»Œ:Buzzer Beat – å±±ä¸‹æ™ºä¹…、åŒ—å·æ™¯å­、ç›¸æ­¦ç´—å­£、è²«åœ°è°·ã—ã»ã‚Š、æºç«¯æ·³å¹³、ä¼Šè—¤è‹±æ˜Žé¡Œæ… å¤æ—¥ + æ„›æƒ… + é‹å‹•é ­å…©é›†æ¯”è¼ƒå¤šæ‰“ç±ƒçƒå ´é¢，å¯ skip æŽ‰。ä¹‹å¾Œçš„å¾ˆå¥½çœ‹çš„!æœªå®Œçš„，ä½†è¥¯é‚„æ˜¯å¤å¤©å…ˆçœ‹çœ‹å§! This is such a pretty table. I have a pitcher that I only use for flowers too but like yours they are fake this time of year. Mine also has white daisies too. By the way a long time ago before I started blogging I was snooping around for an appetizer and found your little penguins. They were such a hit. I love them, almost too cute to eat. Dr. Deb, this is quite a topic! I personally don't feel comfortable with these prcedures more for others that cannot face them than for myself. Thank you for your wisdom and "putting it out there! "So glad you received Little Bird for your niece. I hope she loves it and sees her own divine perfection in the story. Blessings to you on this Thanksgiving! Dusky,Of course….About 5 years ago, there were great deal of debates (here at CDF and elsewhere) on the merit of importing the Sov class DDG instead of the Udaloy, as the PLAN's greatest deficient was in ASW. However, as the augment goes, Sovremenny's Anti-carrier capability (SS-n-22) is clearly a political message in response to the aftermath of the 1996 missile test. he would call round if this didn’t work.I tried Gerry’s suggestion and my washer dryer is now working normally.It is refreshing to find someone who first tries to help, instead of making an unnecessary service visit. Thanks Jerry. / Fantastic story, and I agree to the moral in a big way. For example, my girlfriend always finishes first, but I’m the winner there.Go go Neil. It will be yours some day, if you keep fighting for it.Brandon, from My Own Private Idaho recently posted..
That’s way the betsest answer so far! » Giveaway, Shellfish, Soup » Lobster Bisque and Hamilton Beach Giveaway! !